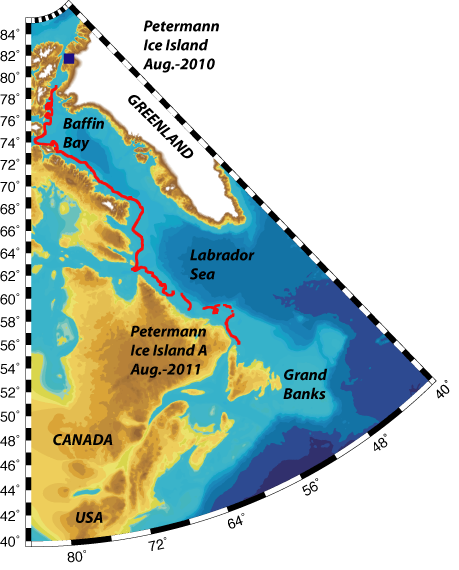 An ice island four times the size of Manhattan separated from Petermann Glacier, Greenland last year. Today one of these Manhattans reached the coast of Newfoundland. Never before has as large a piece of ice from Greenland reached this far south. Does this show a warming climate taping into Greenland’s 20 feet potential to raise global sea level? Greenland’s glaciers always melt with pieces breaking off. This raises sea level if Greenland receives less snow atop than it loses ice at the bottom. For the last 10 years Greenland lost about 200 trillion pounds of mass, net, per year. [At 5 cents per pound, this pays off the federal debt within a year.] Distributing this mass over all oceans, we raise global sea level by one inch in 75 years. Nothing to worry about, but there is a twist: Weight watching satellites show that Greenland becomes thinner, while the Tropic grow fatter. Records of weight gain and loss are too short to draw firm conclusions, yet, but they are consistent across the globe and the trends of gain and loss are increasing, too. We do not understand the physics, stability, and uncertainty of these increasing gains and losses well enough to make reliable predictions. If the climate over Greenland is stable, as it has been for the last 10,000 years, then this matters little. If the present equilibrium reaches a tipping point, where a small change will kick us into different stable state, then we can expect sea level to increase 10 times or more. We understand tipping points in theory, but not in practice. In practical terms, we do not know if our children must deal with two inches of sea level from Greenland by the end of this century or 80 inches or none at all. We know only too well, however, that low-lying places like Bangladesh, the Netherlands, and New Orléans struggle with the sea level we have now. Greenland’s ice island off Newfoundland indicates a globally connected world. Burning stuff over Europe, America, and increasingly Asia creates heat that melts Greenland at a rate that is increasing. What happens in Greenland does not stay in Greenland, but it impacts Rome, Miami, and Shanghai. More ice and rising sea level will come. To play it safe, let’s think smartly what and how we burn. To play it loose and reckless: burn, baby, burn … or was it drill? This entry was posted in Global Warming, Ice Island and tagged climate change, Greenland, Labrador, Petermann, Sealevel, tipping points. Bookmark the permalink. Well I would not get your knickers in a twist over that 20ft. You are obviously not aware of the IPCC’s timing of the event you mention. Really, unless you want to look forward about 500 years, thats like looking back before Shakespeare, I think you should relax. Also, ice drifting south (in the northern hemisphere) is, until recently, considered evidence of cooler than usual temperatures. That what we think here when ice drifts north from Antarctica anyway. By the way, Antarctica is actually experiencing a net gain in ice mass. I. Joughin and S. Tulaczyk, Positive Mass Balance of the Ross Ice Streams, West Antarctic, Science 295, 476-480 (2002) – They found strong evidence for ice sheet growth in West Antarctica. C.H. Davis et al, Snowfall-Driven Growth in East Antarctic Ice Sheet Mitigates Recent Sea-Level Rise, Science 308, 1898-1901 (2005) – They found that the East Antarctic ice sheet is growing at 45 GT/yr, corresponding to a sea level decrease of 0.12 mm/yr. D.J. Wingham et al, Mass balance of the Antarctic ice sheet, Phil Trans Roy Soc A 364, 1627-1635 (2006) – They found that the Antarctic ice sheet is growing at 27 GT/yr, corresponding to a sea level fall of 0.08 mm/yr. The study covered 72% of Antarctica and the period 1992-2003. Thank you for your substantive comments and concerns. I fully agree with you on what the IPCC says with regard to ice sheets and changes in sea level. Actually, I very much make your point at https://icyseas.wordpress.com/2011/07/23/iceisland/ … The largest uncertainty in the 2007 IPCC projections is the state of the ice sheets and ice streams of both Antarctic and Greenland. Their dynamics are presently not modeled very well in any of the models used in the 2007 IPCC report, such as the non-linear retreat taking place at Pine Island glacier, Antarctica (Jenkins et al, 2010: Observations behind Pine Island Glacier in West Antarctica and implications for its retreat, Nature Geoscience, Vol. 3, 468-472). This one glacier has a negative mass balance of the same order of magnitude as the 45 Gt/y (Rignot, 2008) that you use for the East Antarctic ice sheet gain. So, there are always devils in the details, and only careful analysis of data in hand combined with non-linear (not linear) models will reveal what is going on. Please also note, that I did not say that Greenland will raise sea level by 80 feet, but that it can be an inch in 75 years or something a factor 10 larger, but my real point is: we do not understand the (non-linear) physics of ice-sheets, ice streams, and their interaction with the oceans well enough to make ANY predictions. The IPCC projections could be wrong, because they are too small and too conservative, or, they be wrong, because they are too large and excessive. We need observations and better models that take hingeline migrations as well as ice-ocean interactions into proper account.